With so much amazing genealogical content available online for free at FamilySearch, it is easy to get sidetracked, distracted, or otherwise off the beaten path. This is especially true for Michigan researchers, as we are incredibly fortunate to have such a robust collection of vital records databases from which to search in. Yet having a large collection to search is one thing, understanding what it is you are searching is something else. Let’s spend a few minutes and explore the Michigan vital records databases available at FamilySearch, outlining what is there and the differences between state-level and county-level records. There are a few things to consider before we get much further. First, Michigan state-level records are created based on the information provided to the state by the counties. This offers researchers two different record sets – and sources – to find their ancestors’ vital record information; the statewide record and the one held locally at the county. Second, full compliance with the Michigan vital records registration laws was not achieved until the late 1800’s; this means that although an ancestor may have been born, married, or died in the state, there may not be an “official” record for the event. Finally, as with other sources in genealogy research, Michigan vital records have evolved over time. Not all of the critical data, such as parents’ names, are found in the early returns. Death records, in particular, are problematic; with those returns, the parents’ names are not typically identified on the state-level record until certificates were first used beginning in mid-1897. Here is a screenshot of the Michigan databases at FamilySearch, an impressive list. The camera next to the database names indicates images are available, too. Michigan databases available at FamilySearch. Let’s start with the death records databases first. “Michigan, Deaths, 1867-1897” contains images of state-level records of death for that 31-year time period. Deaths from that era were recorded in large ledger books, with each horizontal entry covering two pages. The originals of these state-level deaths are housed in Lansing, and microfilms of this statewide collection can be found at the Library of Michigan, via the network of Family History Centers, and elsewhere. With such a huge date range, researchers are immediately drawn to the other Michigan death record database available at FamilySearch – “Michigan, Deaths and Burials, 1800-1995.” Yet as the database’s “Learn More” link shows, the content here is not statewide, nor does every county contain records for that enormous nearly 200-year time period. This database, then, is largely based on abstracts (not the images) of the county-level records of death available at the various county clerks’ offices around the state. Each entry will then refer researchers to the original source of information; most of these county-level death records fall in the mid-to-late 1800’s and early 1900’s date range, although there are certainly examples from before and after. “Michigan, Deaths, 1971-1996” is an index (not the images) to the state-level records housed with the Michigan Department of Community Health (MDCH) in Lansing. The records themselves are not widely available, so researchers will need to contact MDCH for records of ancestors found in this database. The Michigan births databases are arranged very similarly to the deaths. “Michigan, Births, 1867-1902” contains images of state-level records of birth for that 36-year time period. As with the deaths, births were recorded in large ledger books, with each horizontal entry covering two pages. The originals of these state-level births are housed in Lansing with the Michigan Department of Community Health, and indexes to this statewide collection can be found at the Library of Michigan, via the network of Family History Centers, and elsewhere. As with deaths, there is a similarly vast FamilySearch database for Michigan births: “Michigan, Births and Christenings, 1775-1995.” It, too, is also not statewide nor all-inclusive for that huge 220-year time period. Rather, these abstracts of the county-level births found in courthouses around the state are still an important resource offering critical dates and pointing researchers to the original source. The Michigan marriage records at FamilySearch are particularly strong, including images of both state-level and county-level records. “Michigan, Marriages, 1868-1925” contains images of the state-level record of marriage, and much like the death and birth collections discussed above, each return is recorded in large ledger books with each entry covering two pages. The originals of these state-level marriages are housed in Lansing, and microfilms of this statewide collection can be found at the Library of Michigan, via the network of Family History Centers, and elsewhere. 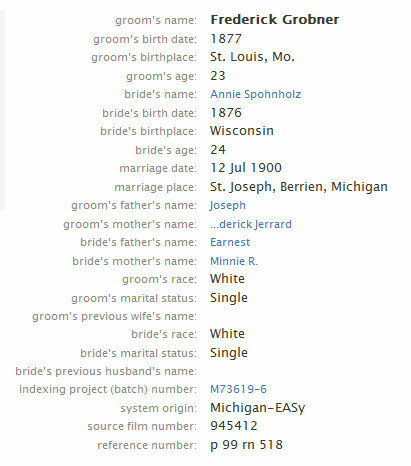 “Michigan, County Marriages, 1820-1935” is a recent addition to the suite of FamilySearch databases, and an excellent one at that. Here, except for 15 counties, researchers have access to the actual image of the marriage record on file with the county. In Michigan, these county-level marriages are particularly important, because in many cases, the county began recording marriages well before the state required it. 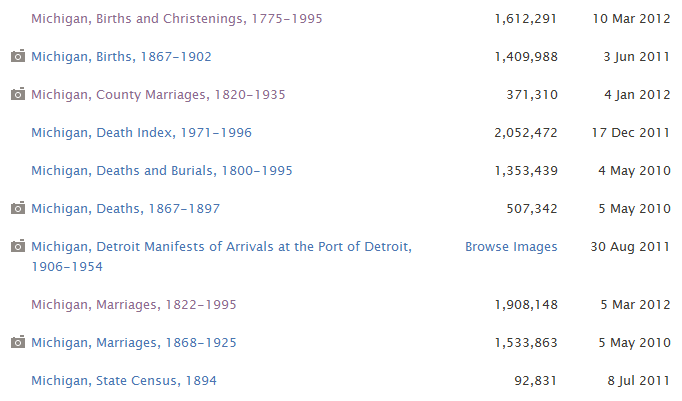 “Michigan, Marriages, 1822-1995” is much like the similarly large deaths and births collections at FamilySearch. These abstracts of county-level typically fall in the mid-to-late 1800’s and early 1900’s date range, although there are examples both before and after. Depending on the county and time period, however, researchers find better results exploring the records themselves in the “Michigan, County Marriages, 1820-1935” database discussed above. Let’s look at one particular marriage, as shown in 3 different FamilySearch databases. 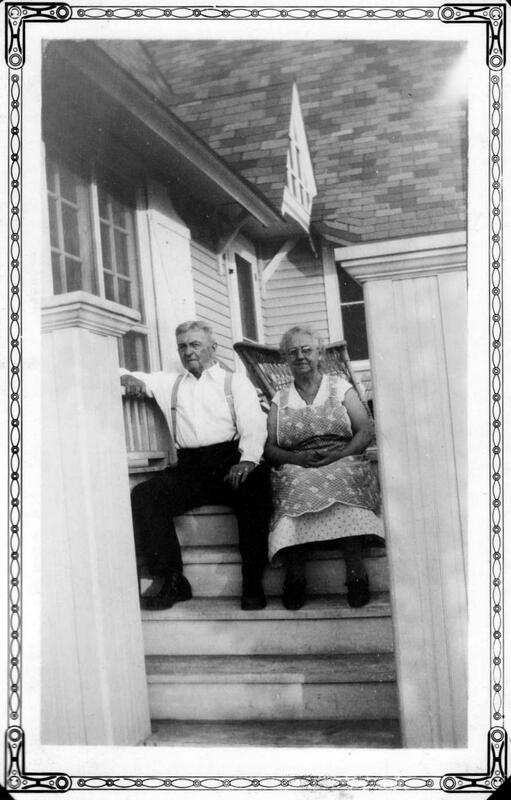 Frederick Grobner and Annie Spohmholz were married in July 1900 in St. Joseph, Berrien County, Michigan. The couple apparently crossed the state line into Michigan to get married before quickly returning to Chicago. Here is the Michigan state-level marriage record, as found in the “Michigan, Marriages, 1868-1925” database. 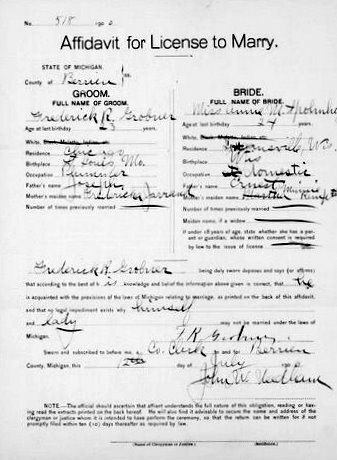 Frederick Grobner and Annie Spohmholz, 12 July 1900, Michigan Return of Marriages, Berrien County, p. 252A, record 518. Here is a different record for the same marriage, as held by Berrien County. This was found in the “Michigan, County Marriages, 1820-1935” database. Finally, here is the entry for the same marriage, as found in the “Michigan, Marriages, 1822-1995” database. Abstract of the Grobner/Spohmholz marriage. In conclusion, Michigan researchers have an impressive array of free online databases to search at FamilySearch. Three databases include the actual state-level record of birth, marriage, and death, three different databases have abstracts of county-level vitals covering huge time periods, one database has county-level images of marriages, and one collection indexes recent death records from the mid-to-late twentieth century. As a local history librarian and family historian, I encourage researchers to start with the known quantity that is the state-level record. Researchers should check each database, but not be discouraged if they are unable to locate their ancestor, as there are dozens (hundreds?) of other alternative sources to look at. Good luck! Being at NGS in Cincinnati this past week, and catching up on things at home, I haven’t had much time to work on blog postings. Cincinnati was a terrific host city, the conference itself was fantastic, and it was nice to catch up with friends and to make new ones. I’ll write more later on the conference, but for today, I’m going to look at one of my more treasured family photographs. Shirley Russell, my grandmother, was born in Chicago in 1922. She married William Alderson in 1942, and together, they spent many years with their family in the Windy City before moving to New Buffalo, Michigan in the late 1960’s. I take particular delight in seeing images of my grandmother as a toddler, girl, or young woman, as all of my personal memories of her are as an older woman with snow white hair; the idea of her as someone more youthful – with “not-white” hair – was completely foreign to me until I stumbled across an older collection of family photographs. Shirley Russell and “Grossmama” Frederica Jarand Grobner, Chicago, May 1924. Here, a label with the May 1924 photo identifies my grandmother with “Grossmama,” who I believe is Frederica Jarand Grobner, her great-grandmother. The only other possible ancestor from that time on my tree would be Mary Ann Everett Russell, but with her English and Canadian ancestry, the image’s use of the German “Grossmama” does not fit particularly well. Thus, the likely image of Frederica Jarand emerges; her parents were both born in Germany, and she spent her early years in the German community in Quincy, Illinois. She took over her father’s saloon after his death in 1882 before moving to Chicago with her husband Joseph Grobner around 1890. In the image above, my grandmother would be just past her second birthday, while Frederica would be about 70 years old. Indeed, she would pass away a few years later in July 1930, a few months after the 1930 Census. Multi-generational photos are always priceless in their own way, and this one is no exception. My grandmother’s clear displeasure with getting her picture taken with Grossmama is particularly obvious. Thinking back to some of my own personal experiences, I think we’ve all been there…. One of my all-time favorite family pictures is of my Grandma and Grandpa Alderson, sitting with all of their grandchildren, 5 of us at the time. Taken in the mid-1970’s, I was a young blond-haired toddler. Everyone in the picture, with one exception, has a look of absolute disgust, annoyance, and “I can’t believe I have to sit here for another picture.” My Grandma, on the other hand, looks as if she’d won the lottery, complete with a beaming million-dollar smile. Neither my brother or I remember the circumstances with that photo, but we both just love it. I am reminded of that Alderson smile-fest when I look at another family gem, this one of a different line in the family. Sophus Hansen was born in Denmark in 1860, and after immigrating to the United States, settled in Chicago. He married Rose Grobner in 1895, and together, they lived at 7042 Kimbark Avenue in Chicago for nearly 50 years. Rose Grobner was born in St. Louis, Missouri in 1878, and moved to Chicago with her family around 1890. Rose died in 1939, Sophus in 1945, and they are buried in Mount Hope Cemetery in Chicago. 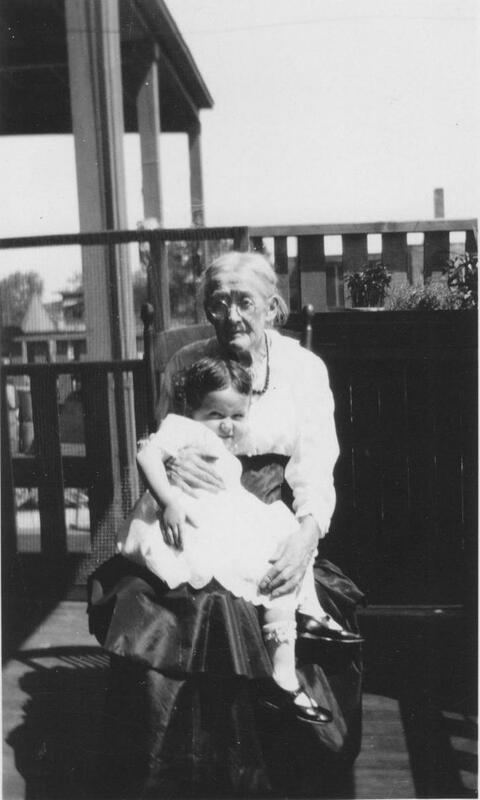 This photo of Sophus and Rose Hansen was taken sometime in the late 1920’s. Their expressions are priceless, and reminiscent of the Alderson photo mentioned above. Sophus and Rose Hansen, c. late 1920's. One of my enduring research mysteries had always been the Grobner family during an 8-year window in the late 1800’s. Living in St. Louis, Joseph and Frederica Grobner seemingly vanished in 1882 until they reappeared in Chicago around 1890. Their three eldest children – including my g-g-grandmother Rose Grobner – were all born in St. Louis, and two other children were later born in Illinois. I’d always presumed that meant Chicago, since the family eventually lived there for decades, but I was unable to locate them in the Windy City during that important 8-year window. Everything came together last year. In planning a fall research trip to Quincy (IL) to further my research on Frederic Jarand (Frederica Grobner’s father), I discovered the Quincy Public Library’s outstanding database of early Quincy newspapers. In full digitized glory, I found piles of information on Frederic Jarand……..and Joseph Grobner and his wife Frederica. Success! Using the Quincy newspapers, city directories, probate files, tax records, and more, I’ve now been able to glimpse into that 8-year window before the Grobner’s eventual arrival in Chicago. After her father Frederic died in 1882, Frederica and Joseph Grobner relocated to Quincy from St. Louis to take over her father’s saloon. Financial difficulties perhaps played a role in the family later relocating to Chicago around 1890. The image here shows a snip from p. 53 of the 1890 Quincy tax records (held at the Gardner Museum of Architecture & Design). The entry for Mrs. F. Grobner clearly shows “Left County,” and their residence at 1254 Kentucky. Joseph Grobner appears in the Chicago city directories shortly thereafter, bringing a gratifying conclusion to one of my many research mysteries.